Songbird Studios is San Francisco’s premier vocal coaching studio, fostering a diverse community of singers of all backgrounds and experience levels. People love us on Yelp! See what students past and present have to say about us. We’re one of Expertise.com’s top 13 picks for Best Voice Teachers in San Francisco! Your First Lesson is On Us! Singers of all ages, backgrounds, and experience are welcome. Our upbeat classes make music fun for babies, toddlers, and parents! Sing, play, and bond with your little love. Performance showcases, special workshops, group classes, guest speakers, and more! 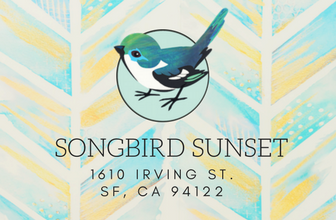 Songbird Studios is the premier voice studio for singers looking for specialized, contemporary, and effective singing lessons and vocal coaching in San Francisco! With multiple Bay Area locations, including Nob Hill, Noe Valley and the Sunset in San Francisco, we have created an inspiring community for singers of all backgrounds and experience levels. I felt like my voice no longer worked and thought maybe I just couldn't sing anymore. But within weeks of working with Ashten, whole new dimensions started opening up in my voice. It is like learning to sing again, but this time with all the technique and artistry that a talented teacher can impart.